Background: Mutations in the ABCA3 gene can result in fatal surfactant deficiency in term newborn infants and chronic interstitial lung disease in older children. Previous studies on ABCA3 mutations have focused primarily on the genetic abnormalities and reported limited clinical information about the resultant disease. A study was undertaken to analyse systematically the clinical presentation, pulmonary function, diagnostic imaging, pathological features and outcomes of children with ABCA3 mutations. Methods: The records of nine children with ABCA3 mutations evaluated at Texas Children’s Hospital between 1992 and 2005 were reviewed and their current clinical status updated. Previous diagnostic imaging studies and lung biopsy specimens were re-examined. The results of DNA analyses were confirmed. Results: Age at symptom onset ranged from birth to 4 years. Cough, crackles, failure to thrive and clubbing were frequent findings. Mean lung function was low but tended to remain static. CT scans commonly revealed ground-glass opacification, septal thickening, parenchymal cysts and pectus excavatum. 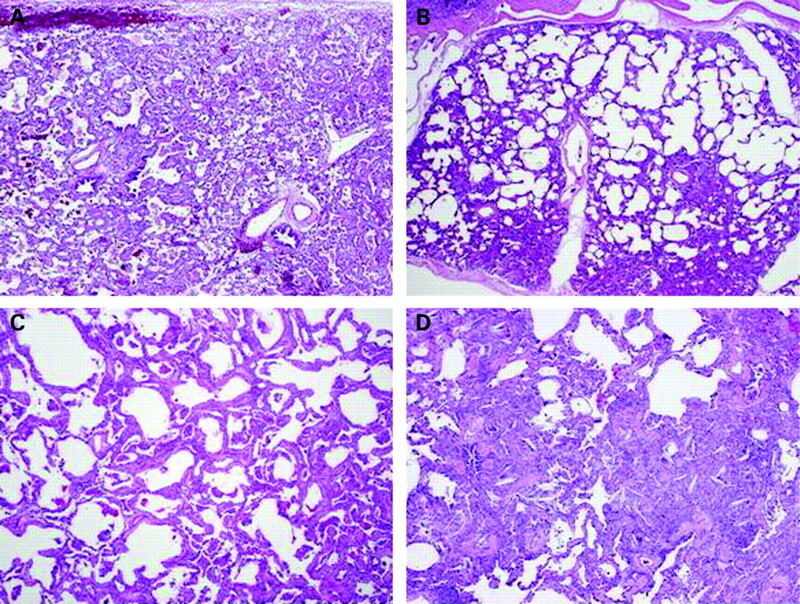 Histopathological patterns included pulmonary alveolar proteinosis, desquamative interstitial pneumonitis and non-specific interstitial pneumonitis, and varied with age. Dense abnormalities of lamellar bodies, characteristic of ABCA3 mutations, were seen by electron microscopy in all adequate specimens. Outcomes varied with the age at which the severity of lung disease warranted open lung biopsy, and some patients have had prolonged survival without lung transplantation. Conclusions: The presentation and course of interstitial lung disease due to ABCA3 mutations are variable, and open lung biopsy and genetic testing are warranted early in the evaluation of children with a consistent clinical picture. An important development in the field of childhood interstitial lung disease (chILD) has been the discovery of inborn errors of surfactant metabolism, including mutations in the surfactant protein B (SP-B), surfactant protein C (SP-C) and ABCA3 genes.1–3 Mutations in these genes cause chILD with varying histopathological patterns including desquamative interstitial pneumonitis (DIP), chronic pneumonitis of infancy, pulmonary alveolar proteinosis (PAP) and non-specific interstitial pneumonitis (NSIP).1–10 ABCA3 is an ATP-binding cassette transporter of lipids that is found in the limiting membrane of lamellar bodies in alveolar type II cells.11 Initially reported as a cause of fatal lung disease in term neonates with a clinical picture similar to that of SP-B deficiency,3 mutations in the ABCA3 gene are now known also to cause chronic interstitial lung disease (ILD) in older patients.8 Previous reports on ABCA3 mutations focused primarily on the genetic abnormalities and gave limited clinical information about the resultant disease beyond the neonatal period. We present an analysis of nine children with ABCA3 mutations evaluated at a single medical centre in order to describe more fully the clinical presentations, pulmonary function, diagnostic imaging, pathological features and outcomes of children with this disorder. All nine patients in our cohort were born at term. Five had respiratory symptoms in the newborn period, including three patients who developed respiratory failure (two were extubated after 2 days; one had progressive deterioration) and two patients who were treated for pneumonia with intravenous antibiotics and/or oxygen. In the four patients who were eventually discharged home, three continued to have either persistent or intermittent respiratory symptoms (described below), while one infant was apparently well until 8 months of age. In the other four children who had an unremarkable neonatal course, the age at symptom onset ranged from 3 months to 4 years. Known environmental exposures were present in three patients: one to birds and two to cigarette smoke. A family history of chILD was absent at the time of initial evaluation in all nine cases. The eight patients who did not have persistent respiratory failure from the newborn period all presented later with cough, tachypnoea, dyspnoea and exercise intolerance (table 1). Most had hypoxaemia at rest, while one had hypoxaemia only with exertion. On initial evaluation at our centre, the majority of patients were below the 5th percentile for weight and had crackles and retractions on examination. Only one child had wheezing. The seven children who were older than 2 years at initial evaluation all had clubbing, and five of them also had pectus excavatum apparent on physical examination. Six patients were able to perform spirometry starting at age 6–8 years (fig 1A). The mean (SD) initial forced vital capacity (FVC) and forced expiratory volume in 1 s (FEV1) percentage predicted were 43.6 (13.9)% and 41.2 (12.0)%, respectively, consistent with severe restrictive lung disease. Most of the patients were unable to perform the manoeuvre for measurement of the carbon monoxide lung transfer factor (Tlco). Figure 1 (A) Changes in forced vital capacity (FVC) percentage predicted over time in six patients with ABCA3 mutations. (B) Changes in weight percentile in the same six patients plotted on a representation of the standard growth curve. Data points in the bottom bar simply represent <5th percentile. Chest radiographs were available for review for all nine patients at various ages. They consistently showed bilateral diffuse or patchy hazy granular or streaky opacities (fig 2). One or more helical or high-resolution axial CT (HRCT) scans were available for review in eight patients; the ninth was too critically ill to undergo CT imaging. On CT scan, all patients had ground-glass opacification that was either diffuse throughout the lungs or patchy but involving multiple or all lobes. The imaging appearance during infancy is very similar to neonatal respiratory distress syndrome. In some patients the intensity of the ground-glass opacification decreased with age, but this did not correlate with improvement in lung function or degree of hypoxaemia. All patients imaged beyond infancy developed fine or coarse peripheral interstitial septal thickening. Five patients eventually developed small (few mm in diameter) air-filled parenchymal lung cysts that tended to increase in number and size over time. Hilar and mediastinal lymphadenopathy (four patients), consolidation and atelectasis that cleared over time (four patients), pleural thickening (three patients) and air trapping (three patients) were also seen. Pectus excavatum (defined as Haller index >2.7)14 developed in all patients surviving beyond infancy. Figure 2 Major radiographic patterns seen with ABCA3 mutations. (A) Anteroposterior chest radiograph from a 3-month-old girl showing diffuse hazy granular pulmonary opacification. (B) Axial high-resolution CT (HRCT) image of the same infant showing diffuse ground-glass opacification of the lungs. (C) Axial HRCT image from a 6-year-old girl showing mosaic lung attenuation with widespread ground-glass opacification. (D) Imaging of the same child at 9 years of age showing continued widespread ground-glass attenuation in a similar distribution and development of small air-filled lung cysts and thickening of the peripheral pulmonary interstitium. Diagnostic lung biopsy slides were available for review in all nine patients, including three with a second biopsy and two with subsequent lung pathology specimens after transplantation and at autopsy. The time interval between specimens was <1 month for three patients and similar histological features were seen in the paired specimens in each case. Two subjects (patients 1 and 6) had an extended interval between biopsies (4 years in both cases), and these biopsies are considered separately. Histological features and major patterns of disease for these 11 biopsies are summarised in table 2. The spectrum of overlapping histological findings were grouped into three major categories: PAP pattern, DIP pattern and NSIP pattern (fig 3). Features present in all 11 cases included some degree of lobular remodelling, at least focally increased alveolar macrophages and at least focal pneumocyte hyperplasia. All cases showed either alveolar proteinosis material or cholesterol clefts (endogenous lipoid pneumonia), with both features present in five biopsies. Alveolar proteinosis material and diffuse alveolar epithelial hyperplasia were most prominent in the infants and were inconspicuous in the older children at the time of biopsy. Iron-laden macrophages were present in all patients except for the two youngest (aged 3 weeks and 1 month). Lobular remodelling was most prominent in the older children, although this finding was variable with some biopsies showing a patchy distribution of architectural abnormalities. Figure 3 Major histological patterns associated with ABCA3 mutations. (A, B) Pulmonary alveolar proteinosis (PAP) pattern in infancy is characterised by early lobular remodelling, interstitial widening, diffuse alveolar epithelial hyperplasia and predominantly fine granular proteinosis material admixed with foamy macrophages. There are no significant inflammatory infiltrates. (A, B, 3-month-old girl, 4× and 20× original magnification, respectively). (C, D) Desquamative interstitial pneumonitis (DIP) pattern in infancy is characterised by prominent clustered alveolar macrophages (C, 2-month-old girl, 10× original magnification). Other findings may include interstitial widening, diffuse reactive alveolar epithelial hyperplasia and focal globular proteinaceous material (D, 2-month-old girl, 20× original magnification). Inflammatory infiltrates are inconspicuous. (E, F) Non-specific interstitial pneumonitis (NSIP) pattern in older children is characterised by lobular remodelling, increased interstitial smooth muscle and patchy mild interstitial lymphocyte infiltrates (E, 6-year-old girl, 10× original magnification). These findings are often associated with cholesterol granulomas (endogenous lipoid pneumonia), with or without lymphoid hyperplasia (F, 2-year-old boy, 20× original magnification). The two patients with follow-up biopsies at prolonged intervals allowed for examination of the progression of histological findings over time. When a biopsy specimen was taken at 3 weeks of age, patient 1 initially had a PAP pattern with early lobular remodelling and a reactive widened interstitium (fig 4A and B). At follow-up biopsy 4 years later, the lung showed more extensive lobular remodelling (airspace enlargement and increased interstitial smooth muscle), mildly increased interstitial inflammatory cells, but less reactive interstitial widening (fig 4C and D). Alveolar proteinosis was present in both biopsies, with the additional finding of endogenous lipoid pneumonia at 4 years of age. Patient 6 underwent biopsies at 4 years (fig 4E) and 9 years of age (fig 4F), both showing an NSIP pattern with endogenous lipoid pneumonia and extensive lobular remodelling. Both specimens showed increased lymphoid infiltrates and cholesterol clefts, although these findings were more prominent in the second biopsy. Figure 4 Progression of disease in follow-up biopsies. 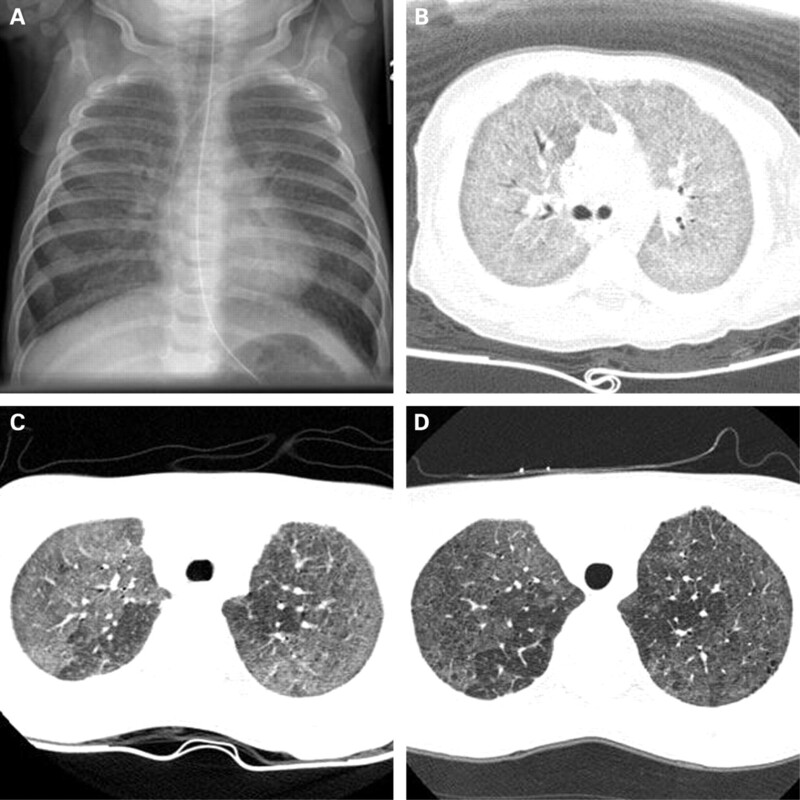 (A, B) Patient 1 initially had a pattern of variant pulmonary alveolar proteinosis (PAP) at 3 weeks of age (A), followed by a predominant pattern of non-specific interstitial pneumonitis (NSIP) at 4 years of age (B). 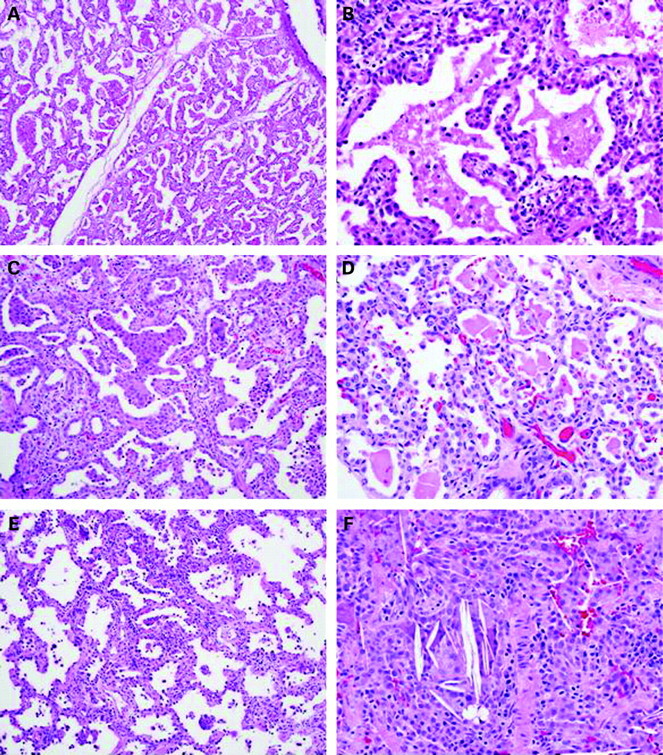 Compared with the first biopsy, the second shows increased airspace enlargement with more pronounced lobular remodelling and interstitial smooth muscle, decreased interstitial widening, similar granular and globular proteinosis material, and occasional foci of endogenous lipoid pneumonia (A, 4× original magnification; B, 2× original magnification). (C, D) Two biopsies in patient 6 both show significant lobular remodelling and increased interstitial smooth muscle, as well as clusters of foamy macrophages. The biopsy at 4 years of age shows an NSIP pattern with patchy mild interstitial lymphocyte infiltrates and only focal endogenous lipoid pneumonia (C, 4× original magnification). The follow-up biopsy at 9 years of age also shows an NSIP pattern, but with much more prominent lymphocytic infiltrates and frequent cholesterol clefts (D, 4× original magnification). Tissue was available for electron microscopic study in six biopsies, with adequate preservation of the ultrastructure in five cases. Characteristic small lamellar dense bodies were identified in all five patients but were more frequent and well formed in the younger children (age range 3 weeks to 2 years) and inconspicuous in the one biopsy from an older child (age 6 years) (fig 5). The dense bodies varied in size and location, including both centrally positioned and eccentric round electron-dense forms. The lamellar structure associated with the dense bodies was delicate and whorled in some areas and more compact with increased electron density in other areas. In addition to these dense bodies, the type II alveolar epithelial cells also showed increased lysosomal material, forming dense black globular cytoplasmic aggregates focally containing components of lamellar membranes, suggesting intralysosomal degeneration of abortive lamellar bodies. Composite lamellar bodies with apparent fusion of two or three whorled lamellar bodies were also detected at least focally in each case. The abnormal dense bodies and degenerating lysosomal lamellar structures were also admixed with a few lamellar bodies of normal size and structure in each case, and these normal lamellar forms predominated in the oldest child (age 6 years). Figure 5 Electron microscopic features of ABCA3 mutations. 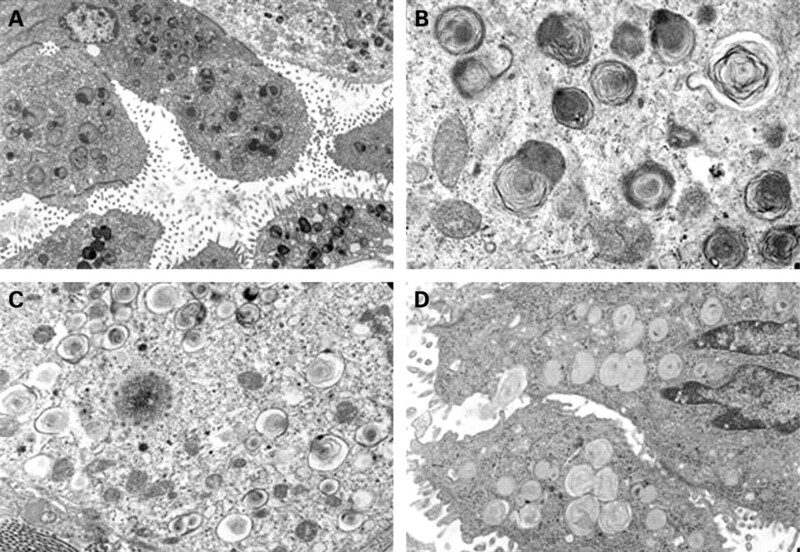 (A, B) Type II alveolar epithelial cells contain characteristic abnormal lamellar bodies with distinctive central and eccentric round dense bodies (A, 2-month-old girl, 4000× original magnification; B, 2-year-old boy, 25 000× original magnification). A few degenerating forms suggesting lysosomal degradation are also noted in some cases. Many cases also contain a few normal lamellar bodies (B, upper right) admixed with the abnormal forms. (C) Findings in a 6-year-old boy include only rare characteristic dense bodies with many lamellar bodies that are small with vague irregular densities (C, 12 000× original magnification) while others show normal size with appropriate delicate whorled structure (D, 10 000× original magnification). Occasional fusion of lamellar bodies is also noted (D). There were eight Caucasians and one Hispanic in the cohort. DNA analysis for mutations in the ABCA3 gene revealed two mutations in all nine patients consistent with autosomal recessive inheritance. Five of these mutations (R20L, ΔF1203, E292V, T114M, Q1591P) have been previously identified in subjects with chILD, whereas the remainder are novel. The E292V mutation was the only one found in more than one patient. Eight patients had been followed for many years with a diagnosis of idiopathic chILD, while one (patient 1) was prospectively diagnosed at 2 months of age. All nine patients were treated with systemic corticosteroids, seven with pulses of intravenous methylprednisolone given on a monthly basis for varying durations. Hydroxychloroquine was added to the treatment regimen of seven patients. Records were not sufficiently complete to determine the short-term response to treatment. Long-term outcomes within our cohort were variable. One infant died from unrelenting respiratory failure at 4 months of age, 1 month after initial presentation (table 1). Three patients underwent lung transplantation at ages 3 months, 5 years and 12 years; the youngest was the child with persistent respiratory failure from the neonatal period. The two youngest transplant recipients have died (one from primary graft dysfunction and one from bronchiolitis obliterans), while the oldest is still alive <1 year after transplantation. The five survivors who have not required transplantation currently range in age from 8 to 18 years. Three of them have had an improvement in the degree of their hypoxaemia (as evaluated by ILD score) while two have not. None have evidence of secondary pulmonary arterial hypertension by electrocardiography or echocardiography. The lung function in four of these five patients has not changed significantly over time; the fifth has had a slow decline from a peak FEV1 of 80% to 40% predicted over 10 years, although he currently reports no symptoms and is very active physically. The mean (SD) latest FVC and FEV1 were 48.9 (14.8)% predicted and 48.1 (18.5)% predicted, respectively, in the five survivors without transplant. 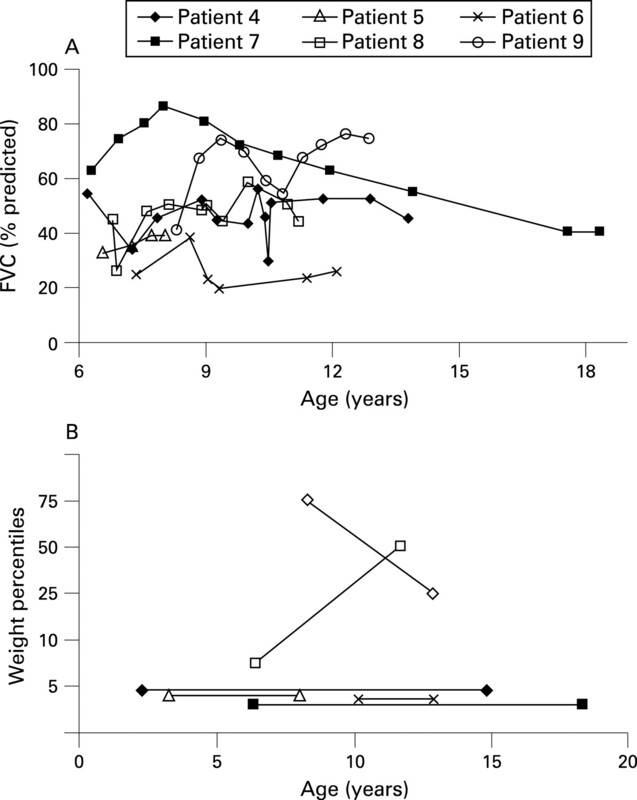 In the six patients who are still alive, all four who had a weight <5th percentile at the initial evaluation are still at <3rd percentile for weight, while the two children who did not have failure to thrive have continued to have normal growth with follow-up intervals ranging from 2 to 12 years (fig 1B). Within our cohort no specific clinical feature correlated with outcome, as measured by the need for lung transplantation or death, although these analyses were difficult because of the small number of patients. 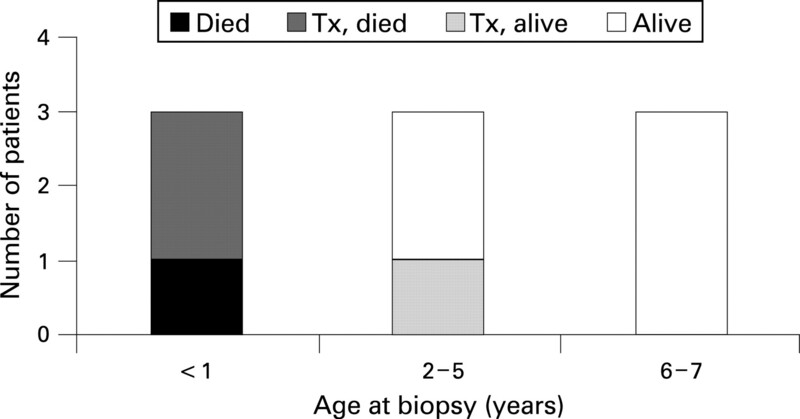 There was a suggestion that younger age at the time of initial lung biopsy might indicate a lower likelihood of surviving without transplantation (fig 6). Figure 6 Outcomes in the nine patients with ABCA3 mutations in relation to age at open lung biopsy. Tx, transplant. Our study is the first to present a systematic review of the clinical features, lung function, imaging changes and histopathology of children with ABCA3 mutations. The results of our analysis extend the descriptions of previous studies and reveal several clinically significant findings not previously described. Although ABCA3 mutations are inherited in an autosomal recessive fashion,3 none of our patients had a positive family history at the time of presentation, underscoring the need to consider this entity even in the absence of such history. The higher proportion of cases with a positive family history reported in previous studies may reflect selected patient populations.3 8 10 The age at symptom onset for nearly half of our patients was beyond the neonatal period and extended to early childhood, re-emphasising the findings of Bullard et al8 that ABCA3 mutations can present as chronic ILD in young children. This study provides the first description of the serial lung function, growth and radiographic changes in children with ABCA3 mutations. The FVC percentage predicted, while initially low, tended to remain stable over many years. Among the survivors without lung transplantation, the majority had a mild improvement in oxygenation. Most of the children who presented with chronic ILD beyond the neonatal period had failure to thrive, and all of these patients continued to grow poorly. The remainder, who underwent open lung biopsy at older ages (suggesting milder disease), did not have growth abnormalities at initial evaluation and they continued to grow well. Serial CT imaging of the lungs consistently showed bilateral ground-glass opacification that in some cases decreased in intensity with age, while peripheral interstitial thickening and small parenchymal lung cysts became more prominent findings over time. Interestingly, pectus excavatum was seen in all patients who were imaged beyond infancy; one child underwent surgical correction of his pectus before he was diagnosed with ABCA3 mutations. We are aware of only one previous report of pectus excavatum in association with chronic ILD in a patient with pulmonary alveolar microlithiasis.15 Changes in CT findings over time did not correlate with lung function, hypoxaemia or outcome, suggesting that once the diagnosis is established, frequent routine imaging studies are not warranted. The systematic review of all open lung biopsy specimens in our series—including repeat biopsies at older ages in two children—showed that the pathological phenotypes of ABCA3 mutations are age-dependent. In the biopsy specimens obtained from young infants, PAP and DIP were the predominant patterns. In the two biopsy specimens from toddlers, one showed a DIP pattern and the other had an NSIP pattern. Finally, the older children—who underwent biopsy at 4–9 years of age—all had an NSIP pattern, often with superimposed endogenous lipoid pneumonia. No cases showed a complete constellation of features seen in chronic pneumonitis of infancy. As this pattern is most often recognised in older infants (6–18 months) with SP-C mutations, its absence in our series may reflect this gap in age distribution. While different histological patterns have been reported in previous studies of ABCA3 mutations,3 8–10 an age-dependent variation in such patterns has not been described. Together with earlier reports, our findings emphasise that disease-causing mutations in the ABCA3 gene can lead to multiple pathological diagnoses. It is important to note that several of our patients had been followed for many years (in one case into adulthood) with the pathological diagnosis of NSIP or DIP, raising the possibility that some adults with long-standing chronic ILD who have these pathological patterns may actually have ABCA3 mutations. The significant heterogeneity and number of novel mutations in the ABCA3 gene found in our patients is similar to the report by Brasch et al10 and suggests that, like other genetic conditions (eg, cystic fibrosis), many more mutations may yet be discovered. The E292V mutation found in two of our patients has been reported as the most common defect in the ABCA3 gene leading to chILD.20 Our study shows that the outcome in children with ABCA3 mutations is also quite variable. Almost half of our patients have survived into the second decade of life without need for lung transplantation. However, we realise that a selection bias may exist in our study due to the referral pattern. Based on the results of our analysis, we conclude that ABCA3 mutations should be considered in the differential diagnoses of newborns with unexplained respiratory distress syndrome and for older infants and young children who have chronic ILD of unclear aetiology. Findings on HRCT scanning—particularly widespread ground-glass opacification, septal thickening and parenchymal lung cysts—can provide supportive evidence of a possible inborn error in surfactant metabolism. DNA analysis for mutations in the ABCA3 gene is necessary for a definitive diagnosis and should also be considered for the SP-B and SP-C genes because of similarities in the clinical, radiological and pathological features of these entities. In patients with suspected ABCA3 mutations and chronic stable disease, confirmatory genetic testing will eliminate the need for a lung biopsy. If genetic testing is equivocal or non-diagnostic, a lung biopsy specimen should be obtained to look for one of the compatible histological patterns and to evaluate for characteristic lamellar dense bodies by electron microscopy. A lung biopsy should also be considered in patients with suspected ABCA3 mutations and rapidly progressive disease. These patients could be candidates for lung transplantation, and awaiting genetic testing results would delay a timely diagnosis. Outcomes in patients with ABCA3 mutations are variable, ranging from severe irreversible respiratory failure in early infancy to chronic static or progressive interstitial lung disease, with many patients surviving well into their second decade without lung transplantation. The authors thank Drs Phil Black, Fran White, Stuart Sweet, Susan Wert, Gail Deutsch, Lisa Young, Aaron Hamvas, Robert Zwerdling, Jason Fullmer and Tarak Patel for their care of these patients and their assistance in our research. We recognise Mr Jim Barrish for his technical expertise in electron microscopy. We also express our appreciation to the patients and their families for their assistance and willingness to participate in the study.
. Deficiency of pulmonary surfactant protein B in congenital alveolar proteinosis. N Engl J Med 1993;328:406–10.
. A mutation in the surfactant protein C gene associated with familial interstitial lung disease. N Engl J Med 2001;344:573–9.
. Heterozygosity for a surfactant protein C gene mutation associated with usual interstitial pneumonitis and cellular nonspecific interstitial pneumonitis in one kindred. Am J Respir Crit Care Med 2002;165:1322–8.
. Mutation of SFTPC in infantile alveolar proteinosis with or without fibrosing lung disease. Am J Med Gen 2004;126A:18–26.
. A common mutation in the surfactant protein C gene associated with lung disease. J Pediatr 2005;146:370–5.
. Nonspecific interstitial pneumonia, alveolar proteinosis, and abnormal proprotein trafficking resulting from a spontaneous mutation in the surfactant protein C gene. Pediatr Res 2005;57:89–98.
. Alteration of the pulmonary surfactant system in full-term infants with hereditary ABCA3 deficiency. Am J Respir Crit Care Med 2006;174:571–80.
. Identification of LBM180, a lamellar body limiting protein of alveolar type II cells, as the ABC transporter protein ABCA3. J Biol Chem 2002;277:22147–55.
. Factors influencing survival in children with chronic interstitial lung disease. Am J Respir Crit Care Med 1997;156:939–42.
. Persistent tachypnea and hypoxia in a 3-month-old term infant. J Pediatr 2006;149:702–6.
. Reliability of a standardized protocol to calculate cross-sectional chest area and severity indices to evaluate pectus excavatum. J Pediatr Surg 2006;41:1219–25.
. Pulmonary alveolar microlithiasis with pectus excavatum. Case report. Indian J Med Sci 1994;48:199–200.
. Deficiency of lamellar bodies in alveolar type II cells associated with fatal respiratory disease in a full-term infant. Am J Respir Crit Care Med 2000;161:608–14.
. Absence of lamellar bodies with accumulation of dense bodies characterizes a novel form of congenital surfactant defect. Pediatr Dev Pathol 2000;3:335–45.
. Ultrastructure of lamellar bodies in congenital surfactant deficiency. Ultrastruct Pathol 2005;29:503–9.
. A protocol for the handling of tissue obtained by operative lung biopsy: recommendations of the chILD Pathology Co-operative Group. Pediatr Dev Pathol 2006;9:173–80.
. Genetics of pediatric interstitial lung disease. Curr Opin Pediatr 2006;18:287–92.
. Surfactant protein deficiency in familial interstitial lung disease. J Pediatr 2001;139:85–92.
. Neonatal respiratory failure associated with mutation in the surfactant protein C gene. J Perinatol 2006;26:67–70.
. Interstitial lung disease in a baby with a de novo mutation in the SFTPC gene. Eur Respir J 2004;24:30–9.
. Progressive lung disease and surfactant dysfunction with a deletion in surfactant protein C gene. Am J Respir Cell Mol Biol 2004;30:771–6.
. Genetic disorders influencing lung formation and function at birth. Hum Mol Genet 2004;13:R207–15. Funding: LMN was supported by an NIH grant (HL-54703). Ethics approval: This study was approved by the Institutional Review Board of Baylor College of Medicine.